One of the Met’s most experienced search dogs and five eight-week-old puppies have starred alongside Wimbledon Champion and WWF global ambassador Andy Murray in a social media campaign highlighting the fight against poaching and the illegal wildlife trade. With Wimbledon starting today the Met has stepped up training and searches within the grounds. The WWF campaign launches today a video starring Ike and Andy. This is going to be followed later on in The Championships with a second video with Andy and the five Cocker Spaniel puppies, Marigold, Marvin, Matilda, Misha and Maramaduke. Filming took place last week within the famous grounds and Ike’s searching skills were called upon to find a tennis ball belonging to Andy. Ike was bred by another police force and his official kennel name is ‘Icon’-hence the name Ike – and he has been with his handler since he was one-year-old. Now considered a pro, Ike thoroughly enjoys work and his search skills were put to the test during the Commonwealth Games and Olympics. He has searched almost all of London’s iconic sites including the Palace of Westminster, Downing Street and Buckingham Palace. Following the filming with Ike it was the turn of the puppies known by their litter name as ‘Mimosa’. 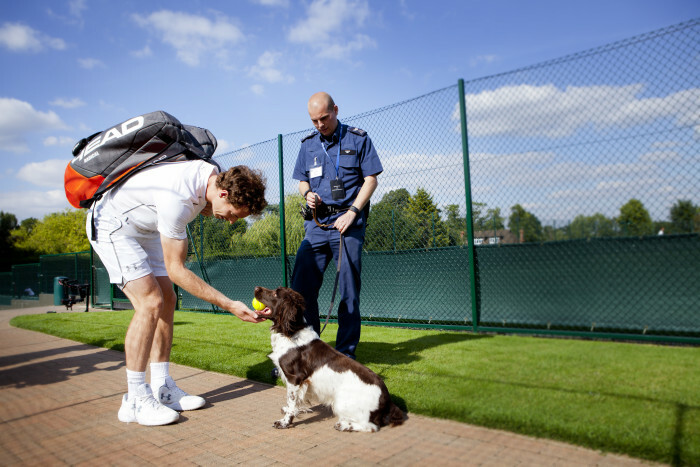 Andy Murray, WWF Global Ambassador meets Metropolitan Police Service dogs at The Championships, Wimbledon to highlight the role of sniffer dogs in the global fight against the illegal wildlife trade. The puppies are part of the largest litter the Met has had, consisting of 13 dogs’ altogether and they made their arrival on the 22nd April. Marigold, Marvin, Matilda, Misha and Maramaduke have yet to start their official training and won’t do until they are around nine months to a year old, so given this they were left to their own devices whilst Andy filmed his piece around them. More about the Met’s dog support unit visit. More about Andy’s support for WWF. To see the Andy and Ike film click on this link.